So I happened to have my family over for dinner recently and was making these crab cakes again, and thought it was a good opportunity to finally post them here. In this instance, I made mini crab cakes, about 2 1/2 inches in diameter, as an appetizer but I often shape them into larger rounds and serve them as a main course. I found the recipe from Martha Stewart years ago and have been making them ever since; I think it was the saltine crackers that initially caught my attention then. What I liked about it was the simplicity. There aren't many ingredients beyond the crab meat - the point being to showcase the sweetness and flavor of the crab itself without a lot of binders or distractions. The other ingredients are mainly pantry items used to boost flavor, not to add bulk, to the crab cakes. I sometimes use lump crab meat but in cases like this where I'm making small ones as an appetizer, I like to go with claw meat. It's not only significantly less expensive but I find that I really like the claw, which has a great sweetness to it if not that chunky texture. I actually use a little more saltines than the recipe specifies to make them easier to shape and handle. Beyond a handful of crushed saltine crackers, an egg, and some mayonnaise to bind a pound of crab meat together, there's flavoring with dashes of Worchestershire sauce, hot sauce, and lemon juice. 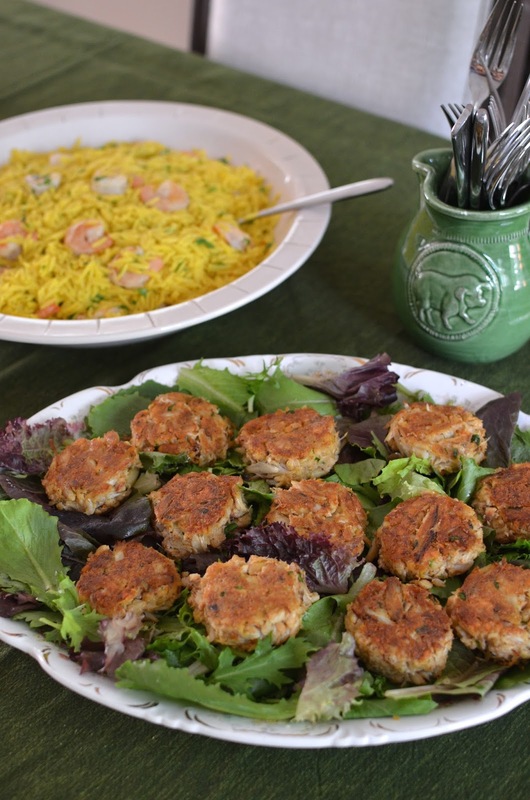 You can certainly amp it up further with additional spices (like old bay seasoning or paprika) but the simple ingredients give you that quintessential Maryland-style crab cake that's all about the crab meat. The holidays will be upon us before we know it! Though I wish I could slow down time, I'm looking forward to it and I know I'll be turning out some crab cakes and other party foods during the season. I am big on routine. I get set in my ways and need to remind myself to loosen up and mix things up sometimes. Lately, we've been adjusting to a new morning routine. With my son starting middle school this year, it means an earlier start to the day. We're out the door closer to around 7:30am rather than the 8am or so timeframe we were accustomed to. So far, I think I actually prefer the new schedule but I happen to be a morning person. So when you think morning, you must think breakfast! With the earlier start to the day, I need a lineup of quick and easy things for us to eat during the weekday mornings. Since my son eats lunch quite early with his fellow 6th graders at school, breakfast doesn't have to be big. It isn't always a muffin but muffins definitely make the cut for weekday breakfast. It's one of those things my son eats quickly and it's just so convenient for everyone. So I've got breakfast and, specifically, muffins on my mind these days. 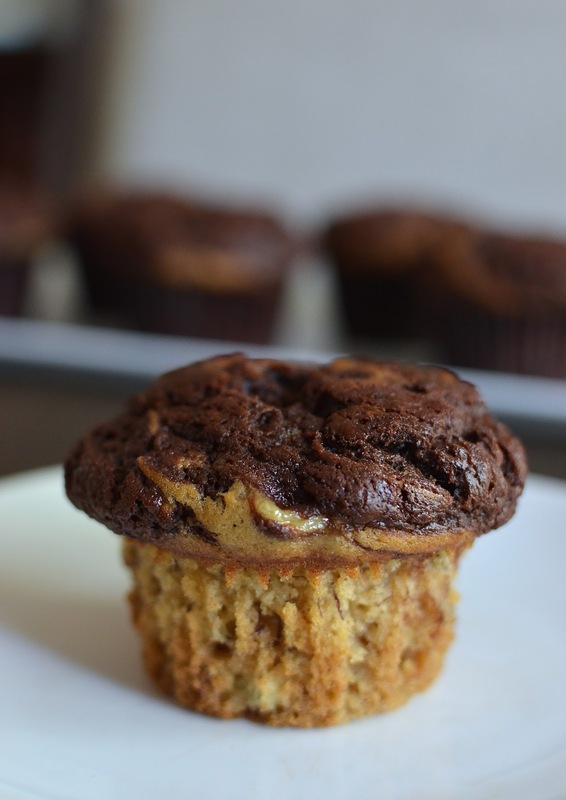 When I saw these chocolate banana swirl muffins in a recent issue of Bake from Scratch magazine, I was happy to try it. The original recipe was for banana chocolate espresso muffins but I kept it a bit more kid-friendly with just chocolate. 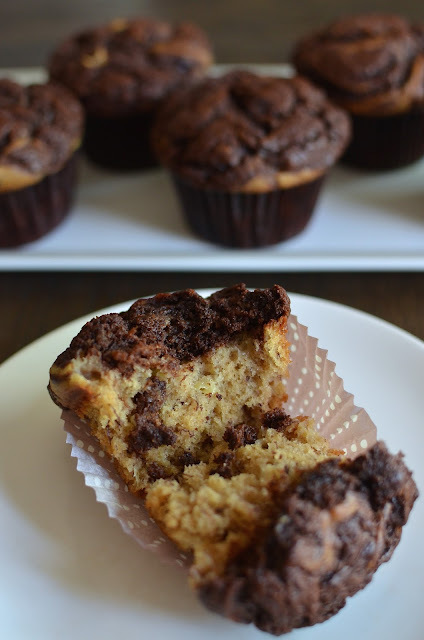 Think marble cake...for these muffins, you mix up a banana muffin batter, then set some of it aside and stir in melted chocolate to make a chocolate version to go with it. I baked the muffins in regular muffin tins rather than jumbo-sized ones as the recipe intended. I found the thick batter difficult to swirl so I basically ended up with dual components - plain banana muffin on the bottom and banana chocolate on top. Visually, it would be fun to have more of a swirl throughout but I think dolloping the two muffin batters alternatively into the muffin cups - instead of dropping the plain batter in first, followed by the chocolate one, and then swirling - would likely do the trick for a more even incorporation of the two. All that said, these banana muffins disappeared quickly. They're moist, fragrant, and flavorful. It's classic banana muffins, with a punch of chocolate thrown in, making for an interesting bite that you want another one of as soon as you take the first. It's a pretty good way to start the morning, if you ask me! Fall officially arrives in a couple of days and we've definitely been making the transition from summer to our more typical routine. The school year started almost two weeks ago and it's kind of momentous for us because our "little" guy started middle school!! It's time to celebrate - time for cake! It's become a little bit of a tradition for me to make a back-to-school cake; last year, I made Baked Alaska. 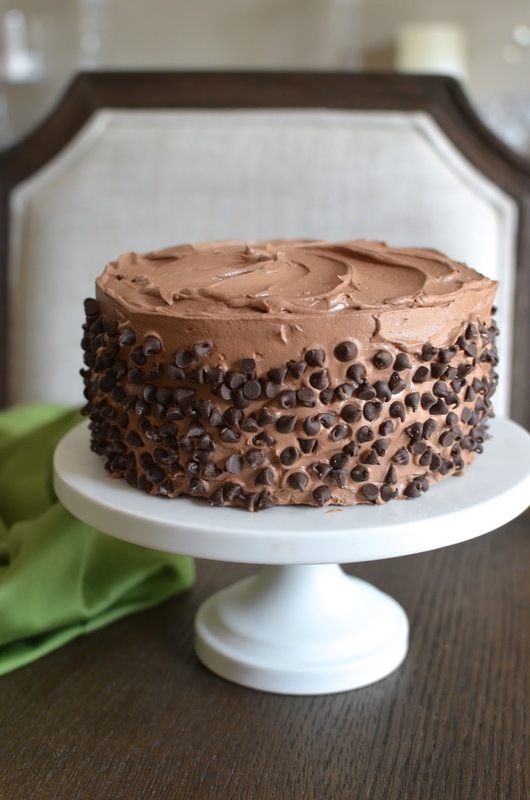 This year, I tried this mint chocolate chip cake you see here. Frankly, it's just fun to have an excuse to celebrate and a reason to try one of the cake recipes I've bookmarked. This was a recipe I bookmarked from America's Test Kitchen. I scaled things down and made this 6-inch, two-layer, version. It was an interesting experience because I have hardly any familiarity with making a white cake, which this one is. I felt a little uncertain along the way but gave it my best shot since mint chocolate chip really sounded like a cake my son would enjoy. Aside from the chocolate chips settling to the bottom of my cake layers instead of being nicely interspersed throughout the cake, I think this endeavor worked out pretty well. The cake was moist and fluffy, with a cool mint flavor from peppermint extract. 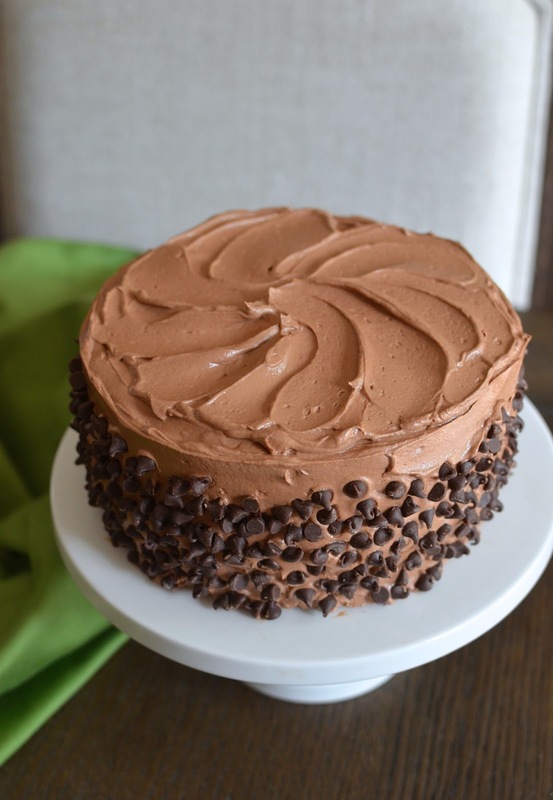 The frosting is chocolaty, smooth, and rich. Studded with more mini chocolate chips on the outside, you have plenty of chocolate represented here, which is how we like our cakes! Mostly importantly, my newly "minted" middle schooler thought it was "really good" and we all enjoyed digging into it. It's nice to stop and enjoy simple things like a piece of cake with my family. These are crazy times and on a micro level, the last couple of weeks have been very busy, as we try to navigate the new structures of middle school. My son just returned from a night of sleep-away camp with his fellow 6th graders and it felt so good to be back together at the dining table again (even if he was only gone for a day and a half). There are certainly changes happening and things yet to figure out but change is usually good and so far, so good (I say, with fingers-crossed). Here's to a smooth school year ahead! Besides the Nutella oat pancakes, here's something else I made for breakfast during the recent long weekend...Bostock - another recipe from Martha Bakes that recently caught my eye. Bostock is something of a cross between French toast and almond croissant - and, as I found out, it is utterly delicious! I don't know about you but hearing "Bostock" doesn't make me think of something I should rush to eat, but it is! Think thick slices of bread (traditionally day-old brioche but I used a Japanese-style white bread), brushed with a vanilla bean simple syrup, topped with a thin layer of apricot jam, then slathered with frangipane, or almond pastry cream, before baking. 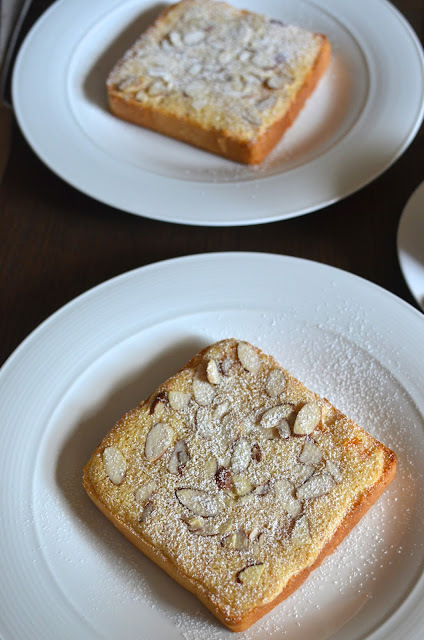 As a big fan of almond pastries and desserts, anything involving frangipane is well worth trying. And as with practically all almond pastries I've had the pleasure of sampling, this Bostock was such a treat! My photos don't do it justice. First of all, it has a great texture. 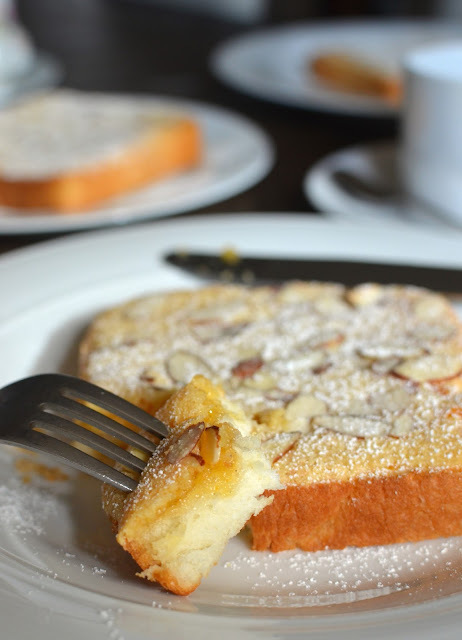 I loved the crunchy edges all around this almond toast, which contrasts nicely with the soft center. Taste-wise, you have a lovely sweetness all round, starting with the sweet bread, then enhanced by the vanilla-bean syrup. The apricot jam adds sweetness but also a little bit of tartness to mix things up a little. And the best part...the frangipane or almond cream, which contributes flavor and aroma. All in, it hits all the right notes for an almond pastry lover like me. To make this, there are a few steps but you could do it all at once and pop it straight into the oven for brunch. For me, it was easier to assemble some of the parts - make the simple syrup and frangipane - the day before so I could finish them off and bake the Bostock for breakfast the next morning. I'm really glad I tried this - and whenever I can say that, I'm happy! The ongoing quest to expand my pancake recipe repertoire continues today with Nutella oat pancakes! I once again have Erika at Southern Soufflé to thank for this recipe. I couldn't resist the sound and look of these pancakes made with a little Nutella chocolate-hazelnut spread and I just wanted a taste as soon as I saw them (I also love her five year old son's adorable artistic rendition of an ice cream cone made with the pancakes, and it really made me smile). We always have Nutella on hand but I didn't have the quick-cooking oats needed for this recipe. So I put it on my grocery list and then with oats in hand, made a batch of these Nutella oat pancakes for my family this past long weekend. It didn't disappoint and we all give it two-thumbs up! The buttermilk-based pancakes are moist and fluffy. Two tablespoons of Nutella stirred into the batter essentially takes the place of butter and sugar typically included in a pancake recipe. The quick oats (I realized that I'd never had/made pancakes with oats before and I was concerned that they'd be too overbearing in pancakes) easily soften in the liquid and meld right into the pancakes. At first bite, my 11-year old said it tasted like an oatmeal cookie, which I thought was a very good sign. 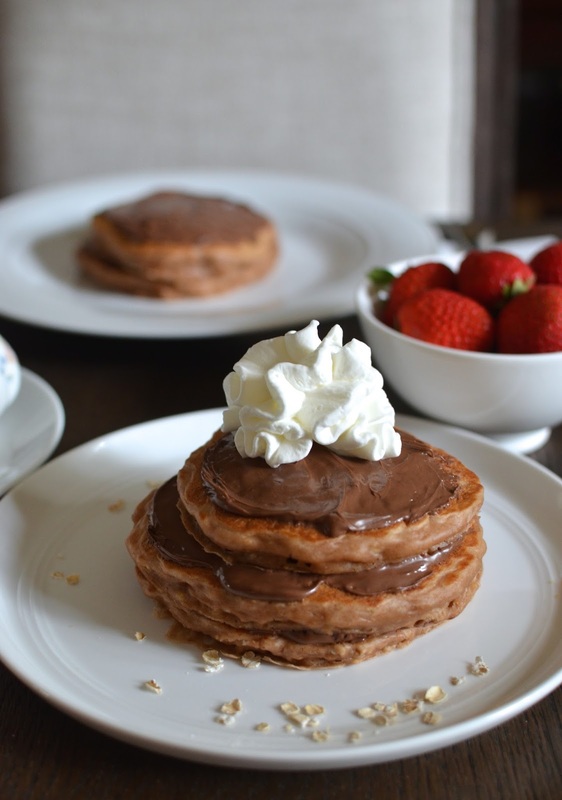 My husband and I thought they were fantastic - pancakes with a familiar fluffy texture, but with a subtle hint of Nutella flavor. The only thing that could make them even better was a little more Nutella spread over each pancake. I don't know about you but at our house, Nutella gets spread on top of pancakes often so it's a familiar routine. In this way, we get more of our favorite thing! For that true diner vibe, we often deploy the whipped cream in the canister, too. That's my husband's preferred way to roll when pancakes and Nutella are involved. Before going on vacation, I was memorized by something I saw on Martha Bakes so it was one of the first things I made when we got back home. It was an "Atlantic Beach Tart", a lemon tart featuring a very unique (certainly, to me) saltine cracker crust! I was intrigued by this crust, which I'd never heard of! I've used graham crackers, digestive biscuits, Oreo cookies, and chocolate wafer cookies for easy press-in crusts but never thought about using saltines - those crackers I have on standby at home in case of upset stomachs! I was really curious and eager to try and have a taste. But first, back to the tart itself...I learned that the Atlantic Beach tart has its roots in North Carolina. It was a dessert commonly served at seafood restaurants along the North Carolina coast. I saw it called a "lazy" lemon tart because of how easy it is to make! The crust is a basic press-in one you'd make much like any other similar ones, and the lemon filling (which you could also make lime or a combination of lemon and lime) is beyond simple, as it only involves whisking sweetened condensed milk with egg yolks and lemon (and/or lime) juice. Happily, I was rewarded with a really delicious lemon tart after this experiment. For me, the best part was that crust! The saltines - crushed and ground together with butter and some sugar, then baked - makes for this salty-sweet shell that is kind of irresistible. I thought it tasted very much like a salty shortbread/pate sucree tart crust. So very interesting and definitely worth a try for anyone else as curious about it as I was. And the filling is distinctly lemony and tart but also sweet because of the richness and sweetness of the condensed milk. 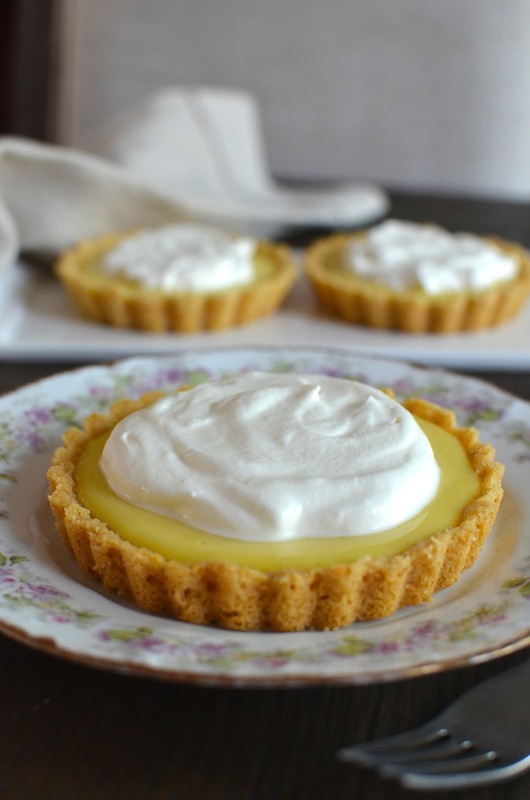 It's thick, dense, and creamy - perfect for those who like their lemon tarts a little less puckery and a bit sweeter, like my husband who turned out to be a big fan of this recipe. Once topped with some whipped cream, you could even sprinkle a few flakes of coarse sea salt on top to accentuate the salty vibe going on. Somehow, I really can picture myself sitting at the seaside and ordering a slice of this Atlantic Beach tart after a seafood dinner! I have to correct myself and note that I actually ended up with "a few" great lemon tarts because I divided my half-recipe and made 3 mini tarts. I was very relieved when they all (even the 2 smaller tarts baked in a tart tin without a removable bottom) popped out successfully. Clearly, there is always something new and interesting to try in the kitchen, and I am grateful for that!